Check into a relaxing Rhode Island retreat overlooking the water, spend a few days in a charming country inn or stay on a historic estate surrounded by acres of quiet nature. If you are looking for a diverse choice of museums, restaurants and attractions, head to Newport, Providence and other Rhode Island destinations. The Chanler at Cliff Walk is a luxury boutique hotel occupying an elegant, ornate 19th century mansion in Newport, Rhode Island. 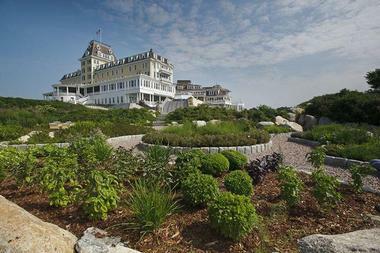 Overlooking Easton Bay, the hotel is surrounded by many famous New England mansions, including The Breakers. The hotel’s 20 rooms and suites are lavishly decorated with original antiques and luxury fabrics. Each follows a theme, from Victorian and Colonial to Louis XIV. Rooms are equipped with modern amenities such as flat-screen TVs, Wi-Fi, DVD players, fireplaces, luxury bathrooms, and wet bars. The hotel is surrounded by magnificent landscaped gardens overlooking the ocean, while the beach is a short walk away. The guests enjoy a gourmet restaurant and a cozy wood-paneled bar. Ocean House is a Forbes Five-Star and AAA Five Diamond hotel housed in meticulously and beautifully reconstructed buildings. There are 49 guestrooms as well as 16 Signature Suites in the Ocean House in addition to several cottages and villas for larger groups. Each of these is designed to complement the beachfront atmosphere with decor from the turn of the 20h century, early New England artwork, and custom wood furnishings. 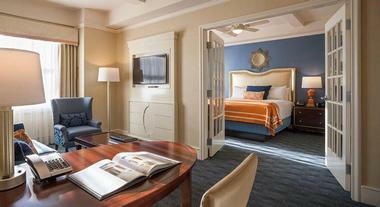 Rooms also include Internet access, iPod docking stations, in-room iPads, and flat screen TVs. The main attraction at Ocean House is without a doubt the spectacular beaches, but enjoying some time around a roaring fire is equally appealing. Guests at the hotel can enjoy the private beach, relax in the living room, go fishing, play croquet, go yachting, play tennis, rent a beach cabana, play squash, or visit the spa, fitness center, or salon. There is also a Wine and Culinary Education program and an Artist in Residence series for those who are interested. Ocean House provides numerous dining options, including the Dune Cottage, Seasons, the Bistro, the Seaside Terrace, or the Verandah. 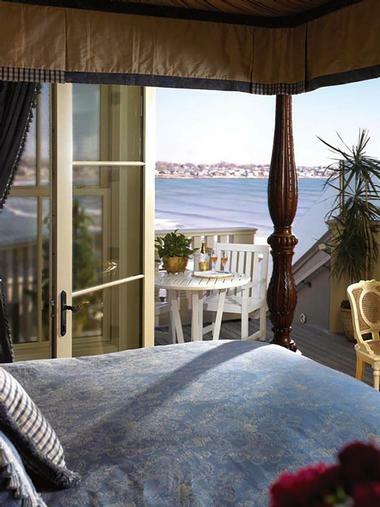 You may also like: Best Romantic Places to Stay in Newport. 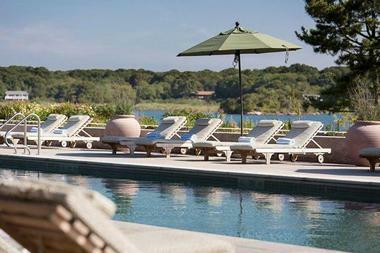 The Weekapaug Inn is perfect for family retreats, intimate getaways, or a weekend of relaxation along the seaside. 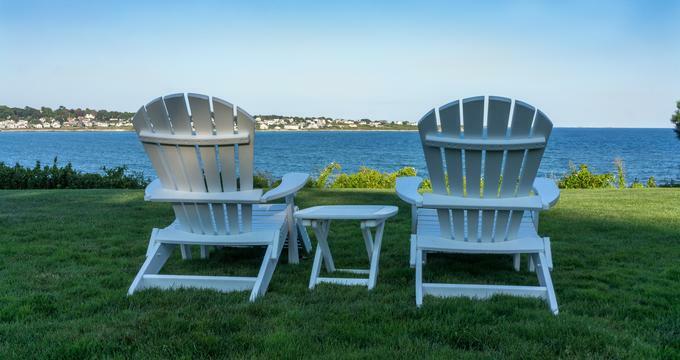 The Inn originally opened in 1899 and now welcomes guests year-round, offering gorgeous views of Block Island, the Atlantic Ocean, and the Pond. Every guest room and suite is unique and features a distinct textile pattern. Each room has at least one original vintage piece from the inn as well as modern amenities and access to a full breakfast. Guests can relax in a rocking chair or couch in the Lobby, the SeaRoom with its porch, the Garden Room, or the Bathhouse, where you can get a light meal and rent an umbrella, towels, and chaise. The Inn also has its own private beach and fitness center, and it offers daily activities such as nature classes and yoga. You will also enjoy the outdoor lap pool, sun deck, bocce and shuffleboard, croquet and squash courts, and the spa and salon. Enjoy a delicious meal in the Restaurant, SeaRoom, Garden Room, Bathhouse, or Lawn. The Christopher Dodge House is a picturesque Providence bed and breakfast, just a short walk away from downtown. The Italianate mansion dates back to 1858. It consists of three stories and has 11-foot ceilings and stunning marble fireplace mantels. All rooms have handcrafted furniture, which are Early American reproductions, and cozy reading chairs. Most rooms have a gas stove or fireplace, and you can select one with a kitchenette. Guests can select from standard rooms, superior rooms, and prime rooms. Some of these rooms have 10 or 11-foot ceilings, tubs and showers, and king-size beds. The prime rooms are conveniently located on the main floor. All guests receive a full breakfast with their reservation, and it is served daily in the dining room. You may also like: 10 Best Things to Do in Pawtucket, Rhode Island. The Lionel Champlin Guest House offers guests the chance to stay in a historic Victorian home that formerly served as a Victorian tearoom during the 1920s. 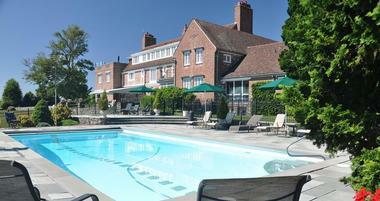 Major renovations have returned the mansion to its former glory with retiled bathrooms and modern amenities. Guests can choose between five rooms and an apartment for families. All guest rooms have their own in suite baths, cotton terry bathrobes, and free Wi-Fi. This guesthouse features an inviting sunroom with a microwave, guest refrigerator, and filtered hot and cold water. The living room has couches, easy chairs, and a fireplace, and there is also a porch as well as a dining room. Guests can also borrow a kayak during their stay. Eden Manor is a historic Victorian estate originally built in 1840 that has been lovingly restored. The estate has 26 rooms in total, including 14 guest rooms. The rooms have some similar features, but each room has been uniquely arranged and decorated. The rooms are spacious and have sitting areas and large windows. Many also have fireplaces. The property sits on 5 acres of land and has historic specimen trees. Within the manor itself, you will find original woodwork and 11-foot ceilings. Visitors can hike or run on the numerous trails or around the property, visit nearby tennis and golf courses, head to historic Newport, or go deep-sea fishing or sailing nearby. Guests can also take a short trip to head to nearby casinos, ferries, and the University of Rhode Island. Edgewood Manor is a historic Greek Revival Mansion constructed around 1905. It is decorated with lovely artwork and beautiful antiques, and guests always enjoy staying in this elegant inn to get a taste of Providence’s history. There are nine rooms in Edgewood Manor and seven in Newhall House, the 1892 Victorian home next door that is also found on the National Historic Register. Every guest room has fine art as well as period antiques in addition to free wireless Internet, cable television, and a private bath. You can also stay in a room with a whirlpool tub or fireplace. The mansion has 18 rooms in total with stained glass and leaded windows as well as five ornate fireplaces. There are also multiple common areas where guests can relax in comfort while admiring the antique furnishings. Point Pleasant Inn lets guests journey back in time while enjoying their vacation in a relaxing bed and breakfast on Bristol Harbor’s Narragansett Bay. There are seven rooms, and specific amenities vary by room, but some include multiple bathrooms, a dressing room, a separate sitting room, separate showers and tubs, oversized antique tubs, original fireplaces, and original oil paintings. Most rooms feature a queen or king bed, but some are able to accommodate more than two people. 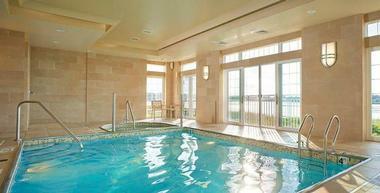 This bed and breakfast has a tennis court, hot tub, swimming pool, open bar, sauna, fitness center, and billiards. There are also bikes that you can borrow to explore the area or you can take a stroll through the tranquil gardens. In the morning, guests can enjoy a breakfast buffet right on the front patio with lovely views of the harbor. Located right along the beachfront, this hotel and suites provide guests with their own strip of land to enjoy as well as panoramic views of the water. 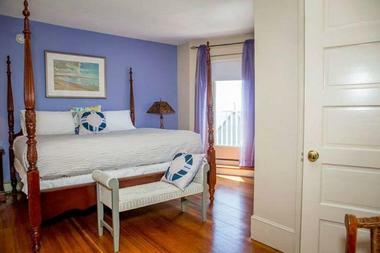 The rooms of the historic building have either a single queen or king bed, two queen beds, or separate bedrooms, and many feature beach views or a living room. The new Suites Building has numerous suites with king size beds, sleeper sofas, Juliet balconies, deep-soaking whirlpool tubs, granite vanities, and dining and living areas with windows stretching from the floor to ceiling. Suites in the suites building also have their own kitchen as well as washers and dryers. In addition to in-room amenities, guests at Newport Beach Hotel & Suites have access to the indoor hot tub and pool with water views and a Juliet balcony as well as the on-site spa. There is also an eye-catching cascading water wall and a rooftop deck with a fire pit, hot tub, and seating areas with amazing views. The Ocean Rose Inn dates back to 1897 and has been welcoming guests to its beachfront location with stunning bay views for over a century. 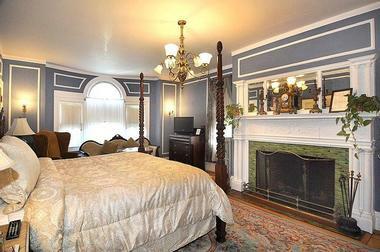 There are 31 rooms in this Victorian-style inn, all of which have hardwood floors. Room options include King, Victorian Villa King, Double-Double, Victorian Villa with Deck, and ADA Accessible Kings. Rooms have private bathrooms and air-conditioning as well as other modern amenities such as TVs. Some also have fireplace facades and private decks. The Victorian Villa rooms are located in the main Victorian building with ocean views and elegant decor such as four-poster beds. Guests have access to Wi-Fi as well as free parking. There are numerous verandahs with rocking chairs where you can sit back and relax while enjoying the peaceful ocean views. The Providence Biltmore, situated in downtown Providence, first opened its doors in 1922, after which it quickly became the city’s tourist center. This landmark building features 294 guestrooms or suites, each of which has a great view of the city. The rooms are rather spacious, and half of them average more than 600 square feet. All rooms were renovated and designed to combine the hotel’s classic elegance with a sophisticated appearance that is appealing in today’s age. They include custom-made beds, exclusive spa amenities, an iHome, a fridge, an in-room safe, an ergonomic desk chair at a workstation, and a 40-inch flat screen LED TVs as well as optional turndown service. The Providence Biltmore has a full-service spa where guests can indulge themselves as well as an on-site restaurant, a Starbucks, valet parking, complimentary Wi-Fi, and a fitness center. McCormick & Schmick’s Seafood & Steaks, the hotel’s restaurant, serves over 30 types of fresh seafood among other dishes. The Pilgrim House Inn Bed and Breakfast is a cozy hotel with a tranquil environment and plenty of charm. This building originally served as a single family home before being converted into apartments for families of the Navy. There are 12 guestrooms with varying features such as queen size beds, queen-size sleeper sofas, oak furniture, private baths, air conditioning, wireless Internet, sitting areas, flat screen TVs, and high ceilings. 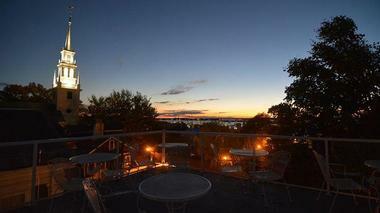 Guests can visit the third floor deck for great views of Newport. Start your mornings with a delicious and healthy breakfast, which includes fresh fruit, cereal, yogurt, hard boiled eggs, homemade banana bread and cakes, bagels, baked goods such as coffee cakes, milk, tea, coffee, and orange juice. You can even buy delicious homemade ice cream. 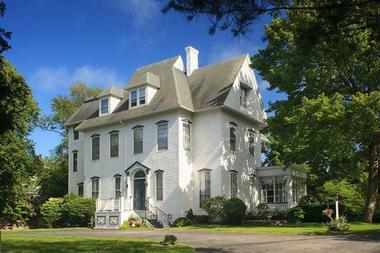 This Newport bed and breakfast was once the home of Admiral William Sowden Sims. Today, the Victorian building hosts guests who want to relax and relive history. The spacious rooms have private baths, free wireless Internet, air conditioning, cable TV, off-street parking, and a hot breakfast. Each of the four rooms has its own special style with original artwork and king-sized beds. Some baths even include soaking tubs. If you want more space, request to stay in Admiral Sims’ Suite, which has a king size bed, a twin bed, and separate sitting room. On the weekends, you can enjoy some live music, and if you want to get out a little, you can take a short walk to the beach and numerous other Newport attractions. In the morning, you will be greeted by a full, hot breakfast that is made fresh daily.